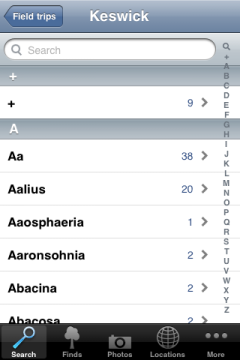 In the search view you see all scientific genus names. 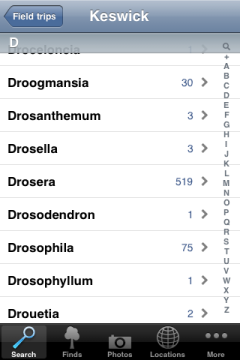 You can scroll to a genus, tap it and get to the species list of that genus. But especially for large databases it is more convenient to use the "keyboard". Eco:Map's names are divided into the domains Scientific and English. In order to make your work in the field less difficult Eco:Map does not distinguish between upper and lower case. 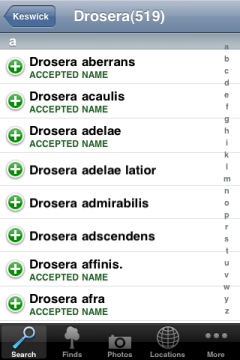 Besides that you need not enter the whole name but only parts of it. Separated by blanks you can enter several search words. The first search word is always regarded as the beginning of a genus and any search word that follows is the beginning of an epithet or further (infraspecies-) information. Entering for example ur d leads you in the Database LUBW to Urtica dioica, Stinging nettle, as the only search result. Please note that Eco:Map starts its search in the background as you type. The number of entries found is constantly refreshed. Searching is cancelled if the number of entries exceeds 1000. To continue in our example field trip select Scientific and type droser rotundi. 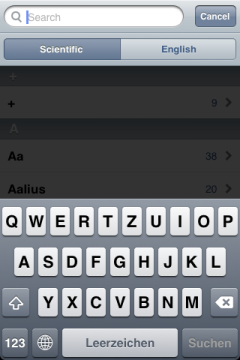 Touch Search on the keyboard. The keyboard is now blanked out. 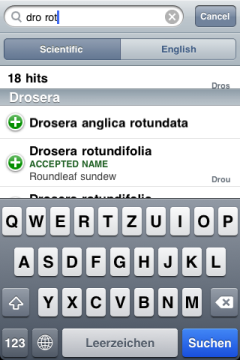 Choose Drosera rotundifolia to get into the individual find dialogue.